Located in the southwest of Eritrea, at a triangular intersection bordering Sudan and Ethiopia adjacent to the Setit River, Omhajer is a semi-urban center inhabited by about 9500 people who live in two administrative areas, Kachero and Omhajer. Omhajer is a multiethnic town and people from eight of Eritrea’s ethnic groups reside there. Most inhabitants rely on agriculture and herding, and the administrative area is one of the dominant agricultural centers of the Goluj sub-zone. Omhajer is a semi-urban center which is believed to have a history dating back to the Italian colonial era when it was established as an administrative center. It slowly grew as farmers and pastoralists from different parts of the country came to settle. 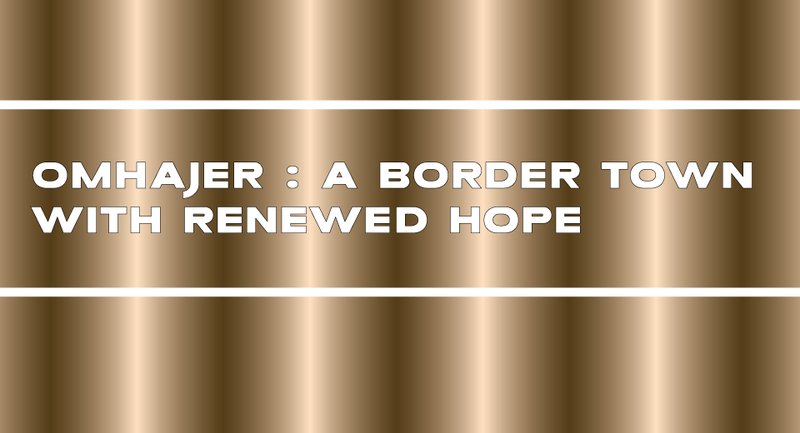 After Eritrea’s independence, due to its strategic location, Omhajer quickly developed underwent considerable change. Inhabitants note that in addition to the great farm potential of the region, trade with neighboring countries (i.e. Sudan and Ethiopia) can improve their lives. Currently, they are looking forward to the opening of the border at the Setit Bridge that connects Eritrea with Ethiopia. Successive Ethiopian regimes have attacked the town in past and caused much destruction. Mr. Tesfalem Andom, administrator of the Omhajer administrative area, said that the area was heavily affected by the 1998-2000 war with Ethiopia. In fact, Ethiopia completely destroyed the town in 2000 and inhabitants were forced to flee their homes. After the end of the war, residents returned to their homes and tried to put their lives back together with government assistance. All of the social service institutions now found in the region were established during that time. Despite its vast potential and considerable resources, Omhajer has not developed to the level or degree that it should have. However, residents of are highly optimistic that the recent normalization of ties with Ethiopia and the opening of the border will boost trade and increase economic growth. As with the rest of Eritrea, on the day sanctions imposed against Eritrea were lifted, the sub-zones of the Gash-Barka region staged celebratory demonstrations. All of the localities expressed their immense joy with the important development. On 15 November, the residents of Omhajer came out into the streets and chanted slogans about the resilience of the Eritrean people. Residents are very optimistic about the future and many described no longer feeling insecurity. Others explained that things are now changing to our advantage and that this period time will be an opportunity to redouble our efforts to improve our lives and focus on development. Since Omhajer is a rich, fertile region, the hard work of the farmers continues to payoff. Owing to Omhajer’s vast grazing area, many pastoralists have come to the area. In fact, it is filled with abundance of livestock. The Bademit Dam, constructed eight years ago, supports local farming activities and it provides much-needed water for livestock. Ultimately, this has helped improve livestock production. Additionally, the Ministry of Agriculture supports farmers with managing livestock health and it conducts regular vaccination campaigns. In 2017, the Government of the State of Eritrea (GSE) issued a national land proclamation allowing every farmer to own two hectares of farmland. As per the proclamation, land which was procured by individuals was redistributed and this provided more people with access to land. The proclamation also addresses the issue of grazing land and the Omhajer administration has established committees to followup on the issue. While it is a fertile area, Omhajer does not have a steady supply of electricity. However, Mr. Tesfalem revealed that this problem is expected to be solved in the near future. Notably, inhabitants have contributed money for the installation of electrical power lines. Omhajer is linked with the Goluj sub-zone by two roads and there are both private and governmentowned transport vehicles that serve residents. This line is one of the busiest transport lines in the southwest of Eritrea. In regard to telecommunication services, residents have access to 24-hour daily mobile telecommunication services. Like many other rural and semi-urban centers of the country, residents of Omhajer have benefited from access to good healthcare services. The inhabitants of this respective area, along with people from Katchero and other areas, have access to a healthcare center located in the town of Omhajer. This healthcare center has been very helpful in combating many diseases, such as malaria, and it is playing a key role in ensuring the overall health of residents. Major health issues which cannot be addressed within the healthcare center are referred to either the Goluj or Tessenei hospital. There is one ambulance in the hospital that is used for referral cases. Omhajer has several education institutions ranging from the preschool to the secondary school level. With the growth of school enrolments in the region and the large number of available teachers, inhabitants are expecting to soon have another secondary school. As well, Mr. Tesfalem indicated that many of the existing schools are in need of renovations. A special feature of Omhajer is its rich natural setting. In the future, it can definitely be a tourist attraction. For example, the nearly 700 meter wide Setit River, which is covered with vegetation, is attractive and could be a popular tourist site. The area also is home to a number of wild animals, such as elephants, antelopes, and rare crocodiles, which could draw animal lovers from around the country and the world.